Vote Tuvan First Ballet Dancer to Siberian of the Year! Voting for the best Siberian people starts today, January 30 on www.sib21vek.ru and will last till February 7. There are 34 nominees out of which you are to select every day 7, no more and no less. Many of the petenders are actually Siberians only by birth or have no relation to Siberia at all, like President Putin who is among nominees. But they contribute to the glory of Siberia, organisers believe. Among the nominees is a legendary Tuvan first ballet-dancer Natalia Azhikmaa-Rusheva, who celebrated in 2006 her 80th anniversary. 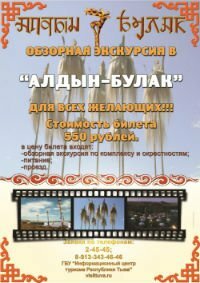 A visit to Chirgilchin's website brings the exciting announcement of a throatsinging camp to be held from August 13-26, 2007. CAMP in TUVA is being presented to twelve individuals from around the world, and will offer not only throatsinging master classes but offer exposure to many different cultural opportunities. Tyva Kyzy female throat-singing ensemble performs today as part of a panel presentation on traditional Tuvan culture at the Seattle Asian Art Museum, 1400 E. Prospect St. Free. 6 p.m. Thurs. Jan. 25, and in a full-scale concert at Meany Hall, UW campus, 543-4880, 8 p.m. Sat. Jan. 27. Norilsk Nickel delegation, headed by Deputy Director General Maxim Finsky, visited the Republic of Tuva Monday. The aim of their visit was to discuss joint projects with local authorities. In particular, the company intends to develop Ak-Sug copper and molybdenum deposit after Norilsk Nickel's affiliate Golevsk Mining and Ore Company Ltd won the right for the deposit development December 15, 2006, offering the once-only payment of $2 m.
Voting for the best Siberian people will start on January 30 and will last till February 7. There are 34 nominees out of which you are to select every day 7, no more and no less. Voting lasts a week. Many of the petenders are actually Siberians only by birth or have no relation to Siberia at all, like President Putin who is among nominees. But they contribute to the glory of Siberia, organisers believe. 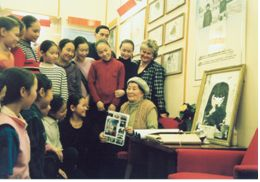 Among the nominees is Tuvan first ballet-dancer Natalia Azhikmaa-Rusheva, who celebrated in 2006 her 80th anniversary. 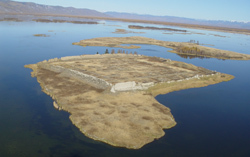 An ancient Uigur Fortress (Por-Bazhyn) on a Tere-Khol lake in the eastern part of Tuva (near Kungurtuk village) can become a 'Russian Shaolin' as Sergei Shoigu, native Tuvan and currently Russian minister for Extraordinary Situations (second in popularity after President Putin Russian) put it in today's Rossiiskaya Gazeta daily. Tuva's Great Khural has been charged with irregularities in financial activity. Criminal action was brought after the checkup held by the Russian Federation Audit Chamber, newslab.ru reports with the reference to the the Prosecutor- General's Office of Russia. A pregnant woman was hiding from doctors in Bay-Taiga Kozhuun (district), the Republic of Tuva, newlab.ru reports. The reason for such a behavior was the woman's wish to give birth to her baby in 2007, when she could have received a maternity stock certificate. The new law introducing a 250,000 ruble ($10000) state donation to the family for their second (third etc) child comes into force January 1, 2007. Shamanic society "Tos Deer" (Nine Heavens) has launched its official web site on the Internet. 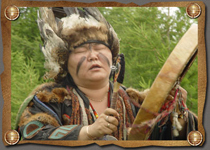 Today on shaman.shude.ru one can learn about the community's Shamans, their leader Ay-Churek (Moonheart), shamanic seminars and tours. The site is developed by web-designer Valeri Irgit. In total there are over 6 official Shaman societies in the Republic of Tuva. They take route from the first ever officially registered in Tuva Dungur (Drum) society. Tuvan Prime-Minister Sherig-ool Oorzhak signed a budget draft bill which would be handed over for the consideration and adoption to the Great Khural Chambers. Overall budget spendings would make 9462.8 billion ruble (appr $364,953,846) with the revenues standing at 9177,5 billion ruble (appr $352,980,769). Tuva's proper revenues will make 27 per cent of the budget and the rest will be donated from Moscow.